Outdoor cooking season is upon us – time to fire up your propane grill and get to work on your charbroiled masterpieces. The question is, can you make your grilled meals as healthy as they are delicious? You can, if you follow a few simple precautions. To avoid conditions that can produce cancer-causing Heterocyclic Amines (HCA) and Polycyclic Aromatic Hydrocarbons (PAH). Taking care of point one is pretty easy – all you need is a thermometer and a reliable reference list of safe food temperatures (such as this one). Use leaner meats – Choosing leaner cuts of beef or pork or skinless chicken will get you started on the right foot. Add color – PAHs and HCAs don’t form on grilled fruits and vegetables, so try adding tomatoes, onions, peppers, zucchini, pineapple, mango, and even apples to your grilled meal. Olive oil is one of the strongest anti-HCA agents; use it liberally. Lamiaceae (mint) family herbs such as basil, mint, rosemary, thyme, oregano, and sage can also reduce HCA formation dramatically. Never baste your grilled food with the liquid the meat was marinating in; this passes raw meat juices to your cooked meat. Marinate meats and poultry for at least 1-2 hours, fish and vegetables for about an hour to get maximum PAH/HCA prevention benefits. Reduce your grilling time – Cook your meat long enough to reach its healthy internal temperature (see above), but not longer than that. Smaller portions such as skewered meats cook faster and spend less time on the grill. Flip food frequently – Flipping frequently helps avoid charring and reduces HCA production. Still cooking on charcoal? Now is the perfect time to make the switch to the precision-temperature control and convenience of propane. Simply purchase a Sabre grill priced at $1,199 or more and you’ll get more than $225 in free accessories – including an EZ Digital Thermometer, a set of four Stainless Steel Dual Skewers, and more! 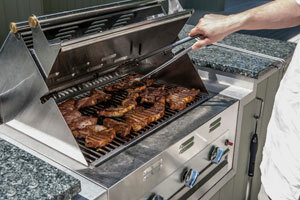 Contact us today to learn more – or visit one of our convenient Connecticut showrooms to see our full line of propane grills and grill accessories!